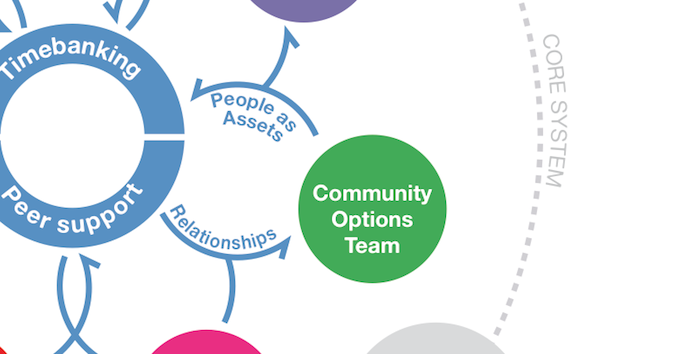 I have been working for COT as a Community Support Guide for the past year, having been seconded from my position in a Thames Reach high support mental health hostel. I was first introduced to the Collaborative when I replied to an internal email advertising a new an exciting opportunity within the Community. I applied for the position and was very excited when I received the telephone call informing me that I had been successful. At the beginning time was spent designing leaflets and logo’s, and assisting the Team manager Terri to create forms, paperwork and a database to securely store all of our information. I gradually started to build a small caseload of clients who were being discharged from their CMHT. It was at this stage that I was introduced to the Recovery Star and Recovery and Support Plan- I had previously used the outcome star so understood the principles of the tool. One of my very first clients was a man who had been engaged with mental health service’s for the last 11 years and was feeling well and stable. Working through the Recovery Star together enabled my client to explore his long forgotten aspirations and begin to identify his skills and worth within the community. It quickly became evident that the majority of my clients were not used to thinking of themselves as valued members of the community and were unable to identify their talents and skills-leaving them in the belief that they have no role in society. My client was keen to get back into work so I introduced him to a volunteering training program hosted by Thames Reach and he completed and submitted his own application form-Completing his own application form was very much the first step for my client and reinforced the Collaborative principles of Co-production -facilitating rather than delivering. My client was accepted onto the Volunteering course and he immediately immersed himself into the work which consisted of classroom based work and a placement within Thames Reach. Most importantly the course enabled my client to develop peer support networks and realise that the greatest experience he has is his own life experience of living with a Mental health issue-something that he could use to help other people who he encountered within his placements at Thames reach. I feel that my way of working has changed dramatically since joining the Community Options Team-I have realised that in the past and with the best intentions, I have disempowered my clients and not allowed them to use and develop the skills that they have and need to get on and live a fulfilling life. Thanks for your message. This is a story from 2012 so Oliver has moved on now but please do let us know if you have any other questions!